H Foyaca-Sibat, L Ibañez-Valdés. Binswanger's Disease And Neurocysticercosis. The Internet Journal of Neurology. 2002 Volume 2 Number 1. We report seven patients who presented with clinical manifestations of ischemic cerebrovascular disease (CVD), dementia, and on CT Scan radiological signs of active neurocysticercosis and Binswanger's Disease (BD) were found. Two patients died due to bilateral pulmonary thromboembolism secondary to deep venous thrombosis on lower limbs and the others remain alive. In almost all of them after one day of treatment with praziquantel(PZQ) some aggravation of the clinical manifestations of BD were observed. 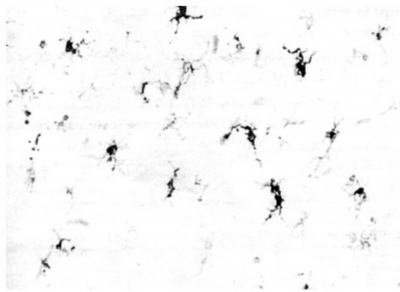 We have hypothesized about the Taenia solium-microglial activation-coagulation disorder and glial disorders-Blood-Brain-Barrier disturbances-Binswanger's disease. We considered that anti-parasitic therapy for active NCC in patients with an associated BD should not be prescribed except for isolated cases when it's extremely necessary. The term état criblé (Cribiform state) and leukoaraiosis described in 1842 and 1987 respectively refers to the dilations of perivascular spaces around cerebral arterioles in the brain of elderly peoples and the radiological images of loss of density of the periventricular WM observed by computerized tomography (CT) of the brain accordingly. The attenuation of the subcortical GM (LA) is a hallmark of the BD. When this syndrome was described by Binswanger, he identified it as a different form of dementia (encephalitis subcorticalis chronica) with lesions of the subcortical WM “severe atheromatosis of the arteries.” In 1982 Tomonaga8 reported an incidence of BD between 3 to 12 percent in the elderly. The etiology of BD is still not certain but dysfunction of the blood-brain-barrier seems to be always present. The aim of this study is to report our finding in some patients with clinical criteria of BD such as: dementia, bilateral radiological abnormalities on computer tomography, evidence of systemic vascular disease, and evidence of focal CVD or evidence of “subcortical cerebral dysfunction”10 and the international accepted criteria for NCC such as evidence of cystic lesion showing the scolex on the CT Scan of the brain. Seven patients fulfilling the clinical criteria of BD and the absolute criteria for NCC were identified prospectively for the study among patients referred to neurology clinic in Umtata General Hospital from peripheral primary-care hospital and health centers during five years period. Some of those patients presented with an associated pulmonary tuberculosis (PTB) and all of them with long-standing history of arterial hypertension. Hypertension was diagnosed according to the criteria of the World Health Organization (Geneva, Switzerland; 1985. Technical Report Series 727). Our hospital is a secondary-care institution, serving a rural area of about 6, 4 million peoples. Patients with stroke (defined as focal neurological deficits of acute onset, lasting more than 24 hours, due to brain ischemia as shown by CT Scan or after clinical and neuroradiological workup) were admitted to our Stroke Units (female and male) after examination in the emergency and casualty department, without further selection. Those patients were studied according to the following protocol: Detailed history of the present complaint, identification of the risk factors for stroke, and physical examination, neurological evaluation at entry and daily for the first ten days, laboratory tests, chest x-ray, electrocardiogram and hemodinamic tests, CT Scan of the brain, coagulation screen, lipid profile, and others looking for cardiovascular diseases or peripheral vasculopathies were carried out when necessary. After the CT scan of the brain, eligible patients (n=7) had an active form of NCC without clinical signs of raised intracranial pressure or epilepsy. 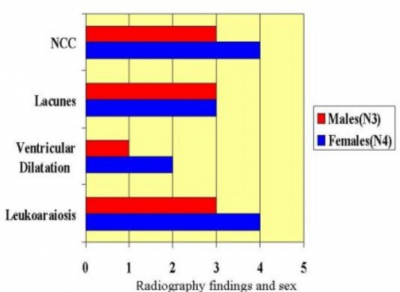 Exclusion criteria for anti-parasitic treatment in this group included age < 59 or > 81 years, resolution of deficits within 24 hours, normal CT Scan, history of alcohol abuse (ie, > 600 g/wk), history of retarded psychomotor development, psychosis, other CNS disorder or systemic diseases known to involve the CNS, patients with severe aphasia and/or sensory impairment (blindness, deafness), severe depression and finally high suspicion of tuberculomas, pyogenic brain abscesses, mycotic granulomas, and primary or metastatic brain tumors (See the flow chart). Apart from aspirin and anticoagulant (when it was necessary), steroids medications and antiparasite treatment, other concomitant treatment was prohibited for patient while participating in the study. All patients received 100mg/kg of PZQ divided in four oral dosages of 25mg/kg each for one day only and 30 mg of prednisone daily during 4 consecutive days, and 150 mg of aspirin after breakfast. We obtained informed consent from each patient. Response to anti-parasite treatment were assessed by neurological evaluation of the CVD disease manifestation at the baseline and one week after the anti-parasitic treatment with PZQ and also with CT Scan of the brain the treatment (a week after) All patient received the same supporting treatment and were encouraged to eat a rich carbohydrate meals and all were evaluated throughout the study by the same personnel. An experienced neurologist evaluated all patients, none patients had no previous history of any other neurological disease apart from clinical manifestations of CVD. 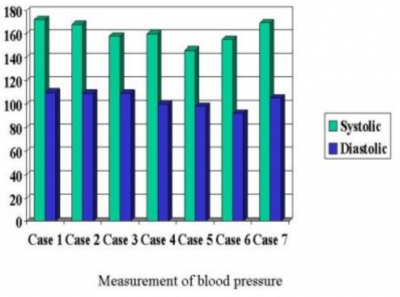 All patients presented with elevated systolic and diastolic blood pressure ranged from 146/93mmHG to 169/114 mmHg. (Table I). 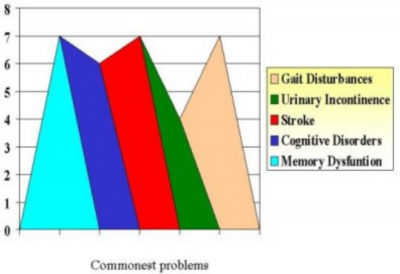 Although cognitive disorder and urinary incontinence are common clinical signs in this group; however combination of memory dysfunction, difficulty walking, and stroke in all of them were observed. (Table II). Absolute criteria for NCC based on neuroimaging findings were present in all selected patients considering the cystic lesion with scolex (bright nodule within the cyst, producing the so-called “hole-with-dot” imaging) as patognomonic (Figure 1), leukoaraiosis was present in all patients, and lacunar infarct on the basal ganglia in six of them (Table III). On physical examination one patient evidenced a mild improvement of gait after one single day therapy with praziquantel, one remained without remarkable changes and the others five worsened. (Table IV) One patient developed generalized tonic-clonic epileptic attacks, other 2 died after coagulation disorders complications and presented deep venous thrombosis, massive pulmonary embolism, and ischemic hemorrhagic stroke (Figure 2) and microglial activation (Figure 3) the others evidenced faster deterioration of the cognitive dysfunction and memory. From our personal experience BD is more common than the figure described by Gautier,7 and is characterized among other signs by subcortical neurological deficits such as gait abnormalities, rigidity, and neurogenic bladder plus psychiatry disorders including mood changes and depression, loss of memory and cognition, hypertension, evidence of systemic vascular disease or disease of the large blood vessels in the neck, stroke, blood abnormalities, and disease of the heart valves in people oldest than 60 years. To treat patients with NCC medically is still a controversial problem; 12 more that two millions of biomedical articles are published every year, and after review of some of them we also found no evidence for treat all patients with NCC or insufficient evidence to assess whether cysticidal therapy in NCC is associated with beneficial effects (2002 Cochrane Database of Systematic Reviews)13 in some articles we found small population for the study, no radomization and double blindness, no control group, no adequate outcome measuring, wrong statitistical analysis, no inclusion or exclusion criteria, poor discussion of the results and some bioethical problems.14 15 16 17 18 19 In spite of the above-mentioned mistakes on research planning, we personally believe that some symptomatic patients without other associated neurological complication require anti-cysticidal therapy for NCC. Ischaemic CVD is a relatively common but under-recognized complication of NCC usually caused by inflammatory occlusion of the arteries at the base of the brain secondary to cyiticercotic arachnoiditis, and lacunar and large infarcts have been reported20 Two of our patients die soon after treatment with PZQ for active lesions of NCC in vesicular stage, both developed ischemic CVD and microhemorrhage (found on the necropsy); in one patient a remarkable deep venous thrombosis which did not response to heparine intravenously was confirmed. Cerebral infarction has been reported 21 22 but not in BD type, therefore from our knowledge it is a novel association no previously reported in the medical literature. Seizure disorder as complication of praziquantel therapy has been also reported,23 in spite of the limitations to differentiated seizures secondary to NCC or PZQ we believe that seizures in our series are NCC related rather than side effect of praziquantel because NCC is the most common cause of acquired epilepsy worldwide and because we have been treating thousands patients with praziquantel for a long time and never ever found similar complication in non-epileptic patients. However seizures also can be present as part of the clinical feature of BD. 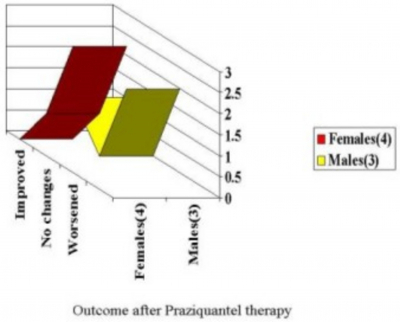 Why those complications happened after praziquantel therapy? Well, some neurophyisiopathological events present when that parasite is dying can explain some aspects. Why aggravation of cognitive dysfunction after praziquantel? First of all is good to establish that we could not distinguish patients with vascular dementia (cognitive syndrome of vascular cause) due to BD from patients with dementia due to Alzheimer Disease (AD) being it a handicap for any credible theoretical explanation but hallmark of BD is WM lesion which can be characterized by lacunes (small infarction less than 1.5 cm in diameter in a deep location without evidence of significant heart disease), etat crible (cribiform or sieve-like atrophy), brain interstitial atrophy, etat lacunaire, and enecephalitis subcorticalis chronica progressiva (Binswanger's), and “unidentified bright objects” (UBOs) on the MRI. Those lesion with hyperintensity in the periventricular WM are zones of chronic WM ischemia due to microvascular disease in the terminal zones of the medullary arteries, typically sparing the short, arcuate subcortical fibers in a pattern that has become associated with BD (partial loss of myelin sheaths and oligodendroglial cells and axon, producing a decrease of the meshwork of the WM tissue, along with mild reactive fibrillary gliosis and sparce macrophages.24 those lesions can be involved in the mechanism of aggravation of cognitive functions mainly after toxins-released by the dying cysticercus, however because some of this finding can be seen also on the brain of elderly peoples and patient with AD we are nor considering such pathological changes as pathognomonic of BD in our series. It is generally well known that senile dementia of the Binswanger type is a well-defined medical condition more commonly diagnosed in centers where technique for myelin stain are used. Although the role of alterations of the blood-brain-barrier linked to hypertensive episodes with chronic vasogenic edema in patients with BD is not well-defined, the role of platelet activation as a major participant in the etiology of thromboembolic stroke is well known. Thromboglobulin (BTG) is a platelet-specific protein that is released into the circulation from activated platelets, its concentration is an indicator of platelet activation in the systemic circulation and its concentration can be influenced by the presence of atherothrombotic lesions, arrhythmias, aging, renal functional impairment,25 and probable vascular lesion associated to cysticercosis. BD promote platelet-derived substances released reactions, inducing vessel wall damage and causing neuronal impairment downstream, chronic ischemia in the hemispheric white matter based on the same mechanism that is aggravated in patients with NCC when the parasite is dying due to host's immunological attack or by anti-cysiticidal drugs. After reviewed the South Africa Literature about NCC26 27 28 29 30 after considering that cerebrovascular diseases are the second common cause of dementia, knowing that cerebrovascular disease is one of the complications of NCC, and that ischemic stroke during praziquantel therapy due to a secondary inflammatory vascular reaction in neurocysticercosis has been reported, 31 32 33 we finally considerate that there is insufficient evidence to determine whether cysticidal therapy is of any clinical benefit to patients with neurocysticercosis and agree with Salinas' article34 therefore we concluded that anti-parasitic medication against Taenia solium for patients with NCC and an associated BD, is not indicated until proven otherwise. We suggest a more emphasis in better primary health care system and health education, vaccination of the pig population, better sanitation and alleviation of poverty as a better way for solving this problem. 1. Hernandez-Cossio O, Hernandez O. Neurocisticercosis y epilepsia en Cuba. Rev Neurol 1999;29:1003-1006. 6. Román CR. On the History of Lacunes, Etat criblé, and the White Matter Lesions of Vascular Dementia. Cerebrovasc Dis 2002;13(suppl 2):1-6. 7. Gautier JC, Mohr JP. Ischemic Stroke. Binswanger's Disease. Guide to clinical neurology . Churchill Livingstone ED 1995 pag 563-564. 8. Tomonaga M, Yamanouchi H, Tohgi H, Kameya M. Clinicopathologic study of progressive subcortical vascular encephalopathy (Binswanger type) in the elderly. J Am Geriatr Soc 1982;30:521-529. 9. Akiguchi I, Tomimoto H, Suenaga T, Wakita H, Bugka H. Allterations in Glia and Axons in the Brains of Binswanger's Disease Patients. Stroke 1997;28:1423-1429. 10. Bennett DA, Wilson RS, Gilley DW, Fox JH. Clinical diagnosis of Binswanger's disease. J Neurol Neurosurg Psych 1990(3):961-965. 11. Del Brutto, Rajshekhar V, White Jr AC, Tsang VCW, et al. Proposed diagnostic criteria for neurocysticercosis. Neurology 2001;57:177-183. 12. Salinas R, Counsell C, Prasad K, Gelband H, Garnet P. Treating neurocysticercosis medically: a review of randomized, controlled trials. Trop Med Int Health 1999; 4(11):13-18. 13. Salinas R, Prassad K. Drugs for treating neurocysticercosis (tapeworm infection of the brain). Cochrane Database of Systematic Reviews. Issue 2, 2002. 14. Chotmonkol V. Treatment of neurocysticercosis with a two week course of albendazole. Southeast Asian J Trop Med Pub Health. 1993:24(2):396-398. 15. Sotelo J, Flisser A. Neurocysticercosis. Practical Treatment guidelines. Cns Drugs 1997;7(1):17-25. 16. Garcia HH, Gilman RH, Horton J, Martinez M, Herrera G, Altamirano J, Cuba JM, Rios-Saavedra N, Verastegui M, Boero J, Gonzalez AE. Albendazole therapy for neurocysticercosis: a prospective double-blind trial comparing 7 versus 14 days of treatment. Neurology 1997;48(5):1421-1427. 17. Sotelo J, Jung H. Pharmacolkinetic optimization of the treatment of neurocysticercosis. Review 1998:34(6):503-515. 18. Del Brutto OH, Campos X, Sanchez J, Mosquera A. Single-day praziquantel versus 1-week albendazole for neurocysticercosis. Neurology 1999;52(5):1079-1081. 19. Singhi P, Ray Singhi S, Khandelwal N. Clinical spectrum of 500 children with neurocysticercosis and response to albendazole therapy. J Child Neurol. 2000:15(4) : 207-213. 20. Del Bruto OH. Cysticercosis and cerebrovascular disease: a review. J Neurol Neurosug Psy 1992;55:252-254. 21. Young Bang Oh, Hoe HJ, Choi SA, Kim DI. Large cerebral infarction during praziquantel therapy in neurocysticercosis.Stroke 1997;28:211-213. 22. Woo E, Yu YL, Huang CY. Cerebral infaction precipitated by praziquantel in neurocysticercosis: a cautionary note. Trop Geogr Med.1988;40:143-146. 23. Fong GCY,Cheung RTF. Caution with praziquantel in neurocysticercosis. Stroke 1997;28:1648-1649. 24. Roman C.G. Impact of Magnetic Resonance Imaging on Vascular Dementia Research. Stroke 1996;27:1269-1273. 25. Iwamoto T, Kubo H, Takasaki M. Platelet Activation in the Cerebral Circulation in Different Subtypes of Ischemic Stroke and Binswanger's Disease. Stroke 1995;26:52-56. 26. Joubert J, Joubert MJ, Lombaard CM. Neurocysticercosis, a comprehensive approach to medical treatment. S Afri Med J. 1985;63:11-14. 27. Shassha W, van Dellen J, Cakata E. Cysticercosis: an analysisi of 141 cases in South Africa. S. Afri J Epidem. Infect. 1986;1:94-97. 28. Joubert J, and van As Ad. 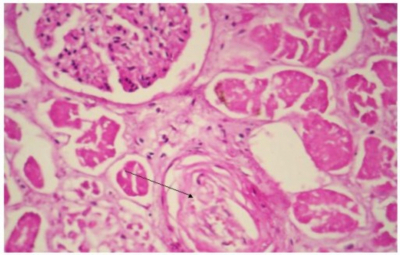 Rapid resolution of giant cysticercal cysts after administration of praziquantel: a report of 4 cases. S. Afri Med J. 1990;77:154-157. 29. Thomson AJ. Neurocysticercosis, experience at the teaching hospital of the University of Cape Town. S Afric Med J. 1993;83:332-334. 30. Bhigjee AI, Sanyika C. Disseminated cysticercosis. J Neurol Neurosurg Psychiatry 1999;66:545546. 31. Woo E, Yu YL, Huang CY. 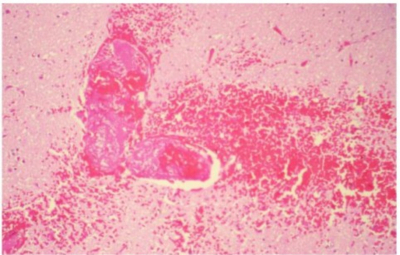 Cerebral infarction precipitated by praziquantel in neurocysticercosis: a cautionary note. Trop Geogr Med. 1988;40:143-146. 32. Bang OY, Heo JH, Choi SA, Kim DI. 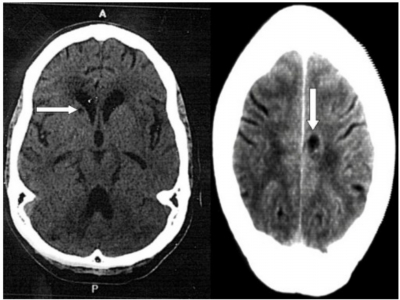 Large cerebral infarction during praziquantel therapy in neurocysticercosis. Stroke. 1997;28:211-213. 33. Del Brutto OH, Sotelo J, Roman GC. Therapy for neurocysticercosis: a reappraisal. Clin Infect Dis. 1993;17:730-735. 34. Salinas R, Counsell C, Prasad K, Gelband H, Gamer P. Treating neurocysticercosis medically: a systematic review of randomized, controlled trials. Trop Med Int Health.1999;4(11):713-718.